For some Americans, getting nutritious, fresh food is pretty easy and not something to think too much about. For others, it’s a day-to-day struggle. 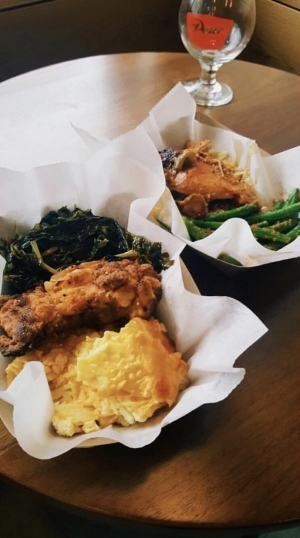 Food of the black diaspora from Piri Durham, an East Durham-based family business. The underlying cause for why this happens is not a matter of personal motivation, or not understanding what it takes to be healthy. These same individuals also find it incredibly difficult to start a small business, buy a home, do well in school, get good exercise, have clean drinking water, or receive good healthcare, just to name a few activities many of us take for granted. The reason for this disparity goes deep into our country’s history and way of doing business. It’s what many food justice advocates, activists, sociologists, and scholars call structural racial inequity. Historical and intentional practices like redlining and racism in planning and development have led to what are presently known as food deserts. Or, more aptly, what community activist, black farmer, and co-founder of the Black Urban Growers based in Bronx, NY Karen Washington calls a food apartheid. These are areas where there is structural inequality between more affluent and primarily white communities compared to low-income communities of color. Food activists and food sovereignty advocates have developed a framework to systematically address issues of structural inequality. They argue that community ownership over land and production of food is the way to address structural racial inequity in the food system. Directing investment and resources into the EFOD framework strengthens existing community businesses while creating space, incubation, and innovation for new businesses. Food-oriented enterprises operating under this framework are more equitable in that they provide an opportunity for all people in the community to be paid a living wage in the food system value chain. An EFOD ecosystem also links local businesses to health and wealth building efforts resulting in local ownership, greater distribution of wealth among communities, and a preservation of local culture. This is an excerpt. Read the complete article here. About the author: Kharmika Tillery-Alston is the World Food Policy Center Food System Finance Fellow, where her role is to provide technical assistance to food entrepreneurs of color that are expanding access to healthy foods in low-income communities. She holds a Master of Public Policy.